Region: of Inverness, near the Point Reyes National Seashore Park. Contemporary cottage, nestled in a quaint neighborhood above the village of Inverness, near the Pt. Reyes National Seashore Park. Our cottage consists of two levels. A main level with an open living and dining area, with high vaulted ceilings, many windows and skylights and a beautiful view of the Inverness Ridge beyond the upper deck with picnic table and gas barbeque. There is a fully equipped kitchen and a bathroom with tub and shower, as well as a television, VCR and stereo. 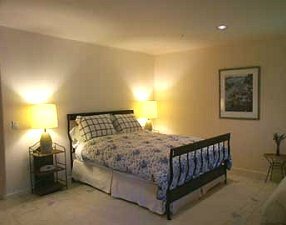 Downstairs is a private bedroom with queen bed, half bathroom, television and VCR, and a small deck with a Japanese garden. 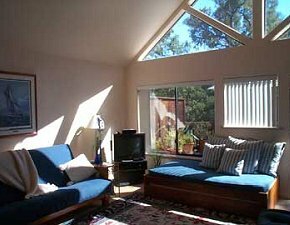 The cottage can accommodate up to five adults with sleeping space in the bedroom and in the living room. The cottage is well equipped and furnished with a comfortable understated feel. Perfect for a weekend retreat or a family get-away. RATES: $200 a night for two, $25 for additional adults, $10 for children over 5, $75 cleaning charge for parties larger than four people. This and other Inverness Bed and Breakfast Inns can be found here in The Register.